You are currently browsing the category archive for the ‘fiddling while the UC burns’ category. Collected press reax to Reynoso report. Some press reactions to the Reynoso report below. Obviously as one of the report’s authors, I don’t have much of substance to say; I think the thing speaks for itself. Some people seem disappointed that the report didn’t call for anyone’s head. The task force was specifically charged not to recommend disciplinary action, just to assign responsibility. It’s up to the university and community to do something with it. For those with an interest in the findings of the commission on the UC Davis pepper-spray incident of November 18, 2011, the report is now available. One sunny mornin’ we’ll rise I know. UPDATE: Berkeley’s Academic Senate has amended its proposed resolution to exclude the “no confidence” provision. Further on up the road, at Berkeley, Michael O’Hare has these things to say about Occupy in the context of the Academic Senate taking up a resolution of no confidence in the Chancellor there. Why do they occupy the UC? 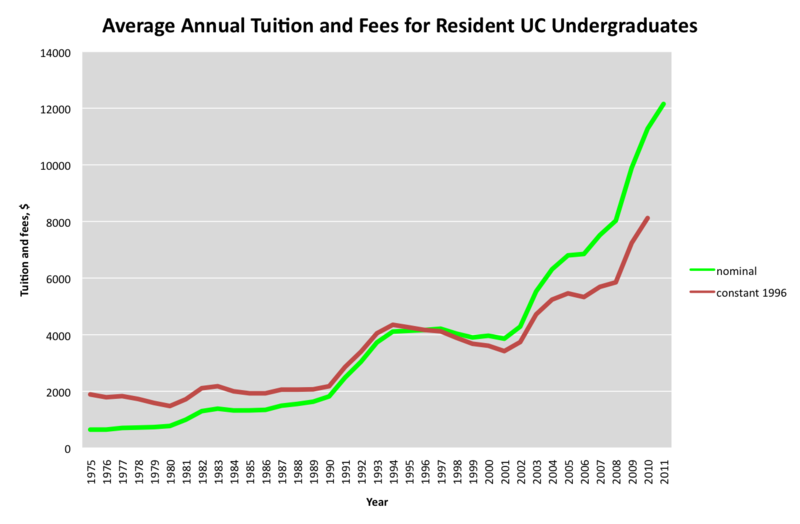 Average annual tuition and fees for California resident undergraduates at the UC. David Simpson of the UC Davis English Department (you know, that English Department) in the London Review of Books blog. Yudof appoints Bratton to investigate police brutality on UC campuses. Irony, asked for comment, too embarrassed by riches to reply. John Quiggin writes about Chancellor Katehi’s role in the legacy of November 17, 1973. Among the legacies of the uprising was a university asylum law that restricted the ability of police to enter university campuses. University asylum was abolished a few months ago, as part of a process aimed at suppressing anti-austerity demonstrations. The abolition law was based on the recommendatiions of an expert committee, which reported a few months ago…. Nick Perrone is a PhD candidate in the Department of History at UC Davis. This is the speech that he gave on the Quad earlier today. My name is Nick Perrone and I am a graduate student in the history department here at UC Davis. I am also the recording secretary for the UAW Local 2865, the union that represents the majority of graduate student employees across the UC system. So I am a student here, I am a worker here, and I am a union representative for my colleagues across campus, and I want to make a couple quick points. First of all, the movement to occupy the Quad here at UC Davis is not an attempt to replicate Occupy Wall Street or any other movement. Students here at UC Davis and at universities across the country have been occupying administrative buildings and open spaces in response to injustices both on and off university campuses for decades. Chancellor Katehi has worked hard to try and characterize this current occupation as being influenced by “non-UC Davis affiliated individuals.” Let me be clear, THIS IS OUR MOVEMENT. Look around you, these are UC Davis students, faculty members and workers. Chancellor Katehi, just because our movement is growing, that does not mean that it must be the result of some outside influence, some “rogue element”. You and the regents that you work for have provided the fuel that drives the movement that you see today. The second point that I want to make is that the police brutality we have witnessed over the past two weeks at Cal State Long Beach, UC Berkeley, and UC Davis is only a symptom of the privatization of these universities. Chancellors Katehi and Birgeneau want safe and inviting spaces on campus, but not for students, for private companies and corporations. When they suppress dissent on our campuses it is in the interest of privatization and clearly not student safety. We must be careful not to treat the symptom alone, but attack the disease itself, the disease of privatization. Chancellor Katehi, we will not allow you, President Yudoff, the regents or anyone else to strangle the students at this university with debt and mediocrity while you simultaneously direct police to suffocate any remaining dissent. It is clear to us that you are no longer an advocate, you are no longer an ally. We need a chancellor who will stand with students against police violence. Our struggle is not your struggle. We want the rich to pay their fair share. 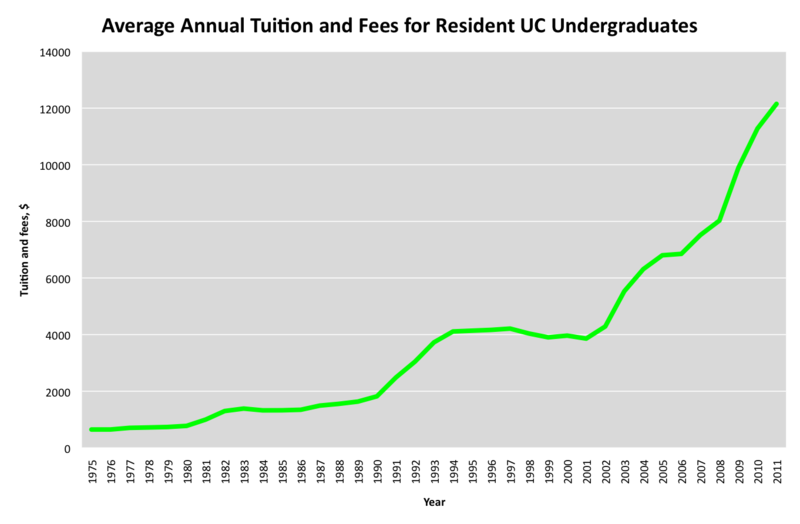 We want to lower tuition, not raise it. We want to end the privatization of our university. And we want to stop the use of police to remove peaceful protesters on college campuses. Chancellor Katehi, you have lost the confidence of the students, the faculty and the workers on this campus and it’s time for you to go. Sometimes you learn from your students rather than teaching them. Backwards ran sentences until reeled the mind. Went down to the demonstration. Some notes and photos from today’s demonstration on the UC Davis quad. I don’t feel GMA wants to do the Chancellor any favors. spending on faculty compensation is never more than 40% of total spending, and “has remained steady or decreased slightly over time”. Then have a look at the numbers. This is a better video of Chancellor Katehi exiting a campus building after her impromptu press conference yesterday. I post this not only to highlight, once again, the extraordinary discipline of the students, but also to share this letter, “Why I walked Chancellor Katehi out of Surge II tonight”. The letter was written and posted to Facebook by Reverend Kristin Stoneking, the director of CA House. Kristin is the woman you see walking with the chancellor in the video above. At 5pm, as my family and I left Davis so that I could attend the American Academy of Religion annual meetings in San Francisco, I received a call from Assistant Vice Chancellor Griselda Castro informing me that she, Chancellor Katehi and others were trapped inside Surge II. She asked if I could mediate between students and administration. I was reluctant; I had already missed a piece of the meetings due to commitments in Davis and didn’t want to miss any more. I called a student (intentionally not named here) and learned that students were surrounding the building but had committed to a peaceful, silent exit for those inside and had created a clear walkway to the street. We turned the car around and headed back to Davis. When I arrived, there was a walkway out of the building set up, lined on both sides by about 300 students. The students were organized and peaceful. I was cleared to enter the building along with a student who is a part of CA House and has been part of the Occupy movement on campus since the beginning. He, too, was reluctant, but not because he had somewhere else to be. For any student to act as a spokesperson or leader is inconsistent with the ethos the Occupy movement. He entered as an individual seeking peace and resolution, not as a representative of the students, and was clear that he had called for and would continue to call for Chancellor Katehi’s resignation. What we felt couldn’t be compromised on was the students’ desire to see and be seen by the Chancellor. Any exit without face to face contact was unacceptable. She was willing to do this. We reached agreement that the students would move to one side of the walkway and sit down as a show of commitment to nonviolence. Before we left, the Chancellor was asked to view a video of the student who was with me being pepper sprayed. She immediately agreed. Then, he and I witnessed her witnessing eight minutes of the violence that occurred Friday. Like a recurring nightmare, the horrific scene and the cries of “You don’t have to do this!” and students choking and screaming rolled again. The student and I then left the building and using the human mike, students were informed that a request had been made that they move to one side and sit down so that the Chancellor could exit. They immediately complied, though I believe she could have left peacefully even without this concession. I returned to the building and walked with the Chancellor down the human walkway to her car. Students remained silent and seated the entire way. Why did I walk the Chancellor to her car? Because I believe in the humanity of all persons. Because I believe that people should be assisted when they are afraid. Because I believe that in showing compassion we embrace a nonviolent way of life that emanates to those whom we refuse to see as enemies and in turn leads to the change that we all seek. I am well aware that my actions were looked on with suspicion by some tonight, but I trust that those seeking a nonviolent solution will know that “just means lead to just ends” and my actions offered dignity not harm. The Chancellor was not trapped in Surge II tonight, but, in a larger sense, we are all in danger of being trapped. We are trapped when we assent to a culture that for decades, and particularly since 9/11, has allowed law enforcement to have more and more power which has moved us into an era of hypercriminalization. We are trapped when we envision no path to reconciliation. And we are trapped when we forget our own power. The students at UC Davis are to be commended for resisting that entrapment, using their own power nonviolently. I pray that the Chancellor will remember her own considerable power in making change on our campus, and in seeking healing and reconciliation. Kristin’s courage and commitment to non-violence, coupled with the dignity of the protestors, serve as a reminder that the brutal tactics of the police are not the only inheritance we still have with us from the long and ongoing struggle for civil rights. UC President Mark Yudof (the President is the head of the system of UC campuses) is “appalled,” and he is interested to know what these investigations will turn up. But he also wants to chat.